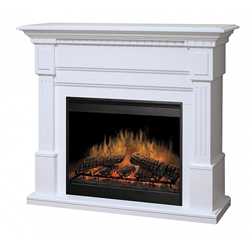 Our Products: Traditional Electric Fireplace Packages > Traditional Electric Fireplace Packages 25" - 28"
The Essex electric fireplace features fluted pilasters, beautiful carvings, and a stepped hearth. Combined with a white finish, the Essex has a classic and elegant look that is perfect for your decor. Mantel Weight - 200 lbs.